Moon Princess slot struck me as a game of contradictions when I opened it to the tune of a frenetic drum and bass beat at the same time as viewing the quite childish cartoon characters that make up some of the slot's icons - they seemed quite disparate together which actually makes the game fun. If you are a fan of Play'n Go cascade slots such as Gemix and Cloud Quest or even Viking Runecraft then I have a feeling this will appeal to you although the theme is quite different here. 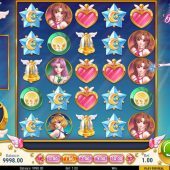 The transparent grid lies over a cartoon night scene with hearts floating about while you are attended by one of the three princesses as you play, but can these ladies work their magic on our bankroll? You play on a 5x5 grid of cascading tiles of which you need 3, 4 or 5 in a row either vertically or horizontally in order to win. Wins of 3-of-a-kind will leave a Wild Moon behind when they disappear too, and winning tiles are not replaced from above unlike some other cascade slots such as Netent's Gonzo's Quest. You pay 20 coins per game and 5 Wild Moons offer 50x bet for a line of 5, each of the 3 Princesses (Love, Star and Storm) 10x, Mixed Princesses 5x, Bell or Heart 3x and finally the Star or Sun icon 2x. You also get an increasing multiplier for every successive winning cascade on the same play, which resets when no more wins are created. Love - transforms one set of symbols into a different one. Star - makes either 1 or 2 Wilds appear on the remaining tiles. Storm - two sets of symbols are desroyed and removed. After her magic is done, she will be replaced on the right by the next Princess waiting for the next random trigger. On the left is a meter of 3 sections and it is filled by wins consisting only of Princesses. A 3-of-a-kind will fill one part, a full 5 the whole thing. When this occurs all three Princesses take turns to do their thing and therefore make it more likely for you to clear the whole grid, which is necessary in order to award you a choice of free games. Once you empty the grid you can choose either 4 Love free spins, 5 Star or 8 Storm spins. Unlike the base game the multiplier isn't reset between spins and can grow to a maximum of 20x, plus you can retrigger by clearing the grid again which also awards an extra 100x stake prize! On every non-winning spin your chosen Princess power is activated too, and the fewer spins you choose from the options above, the higher the volatility is like for example in Jungle Spirit slot's free games.